As the clock ticked down Wednesday night at the Petersen Events Center, the Pitt men’s basketball team’s New Years Eve meltdown had to be fresh in the players’ minds. For Pitt’s seniors, who had yet to defeat Virginia in four tries, another haunting memory seemed to be replaying itself. The sight of Notre Dame guard Steve Vasturia drilling a 3-pointer with 2.5 seconds left in overtime to give the No. 24 Fighting Irish a 78-77 win just four days earlier had to sting. Panthers senior point guard Jamel Artis, seated under the basket as the shot went through, could do nothing but helplessly bang the court in frustration. And Pitt’s seniors surely will never forget when Syracuse point guard Tyler Ennis drove the length of the floor with 4.4 seconds left and nailed a miracle 3-pointer at the buzzer, giving the No. 1 Orange a 58-56 victory over the Panthers at the Pete in 2014. The shocked Oakland Zoo fell silent, and Syracuse improved its perfect record to 24-0 on the season. All those memories came to the forefront Wednesday night, as Pitt led the No. 11 Virginia Cavaliers, 70-67, with less than 10 seconds left in regulation. Cavaliers senior point guard London Perrantes — the ACC’s leading 3-point shooter in 2015-16 — calmly received the inbounds pass, dribbled the ball up the court and released a long-distance three. If you’re following along with the theme, the result should come as no surprise — nothing but net. The end result of the game, though, was different than in years past. 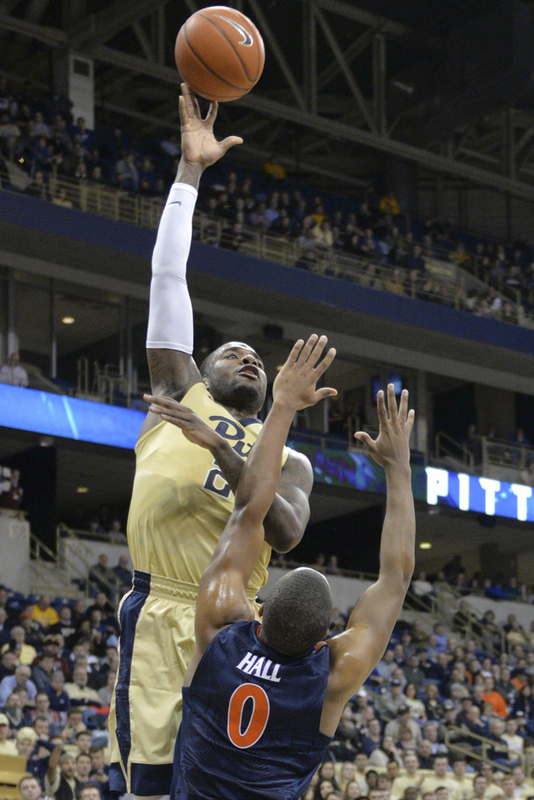 This time, Pitt came out for overtime refocused and rejuvenated. The Panthers seized the momentum on three straight 3-pointers to open the extra period and built a nine-point lead that was too much for Virginia to overcome. Pitt went on to win, 88-76, but it wasn’t just any victory. The triumph holds a special significance not just based on the strength of the opponent but in the way the Panthers overcame adversity and responded to come out on top. Stallings wasn’t around for Ennis’ buzzer-beater, but that didn’t make Perrantes’ shot any easier for him to handle. Some brought up the argument that Stallings could have avoided watching the shot go in by intentionally fouling Perrantes, thus putting him at the free throw line for two shots instead of having a chance at a game-tying three. Stallings said he told his team to foul Perrantes — who received the inbounds pass with about eight seconds left — only when the clock ticked under five. But by the time five seconds remained, Perrantes was already hoisting up the three. Having another win snatched away at the last second would have been extremely tough for these Panthers, as the team came into this game winless in four career meetings against Virginia. Stallings said that desire to get his seniors a win over Virginia — not earning his first ACC win and first win over a ranked opponent at Pitt — gave the win special meaning for him.